Map-based exhibits are built on top of geospatial layers. Select a default spatial layer for your exhibit by clicking on the input to display the list of available layers, and click to select. This will be the layer that’s displayed when an exhibit is first accessed. This is an important selection, since the default layer will often strongly influence the visual aesthetic of the exhibit. Neatline exhibits can be customized using georectified historical maps or custom base layers, by publishing the layers to the web using a piece of software called Geoserver, an open-source geospatial server that does the computationally-intensive work of piping the georeferenced image tiles into the Neatline exhibits. See Installing Geoserver for more details. This option is especially useful for historic exhibits, where the contemporary default map layers may not accurately depict historic conditions. Georeferenced spatial layers also provide a method of bringing in other types of geographic spatial data you may have for your exhibit. You may still want one or more of the provided spatial layers to be available in your exhibit, if so, follow the instructions above to add these. Select the option ‘None (Image or WMS as Deafult)’ for the Default Spatial Layer. Load your georeferenced map into Geoserver as a WMS (Web Map Services) layer. In the Neatline Exhibit Settings, fill in the the top-level WMS address for the GeoServer installation (this always ends with /wms, and might look something like localhost:8080/GeoServer/wms). 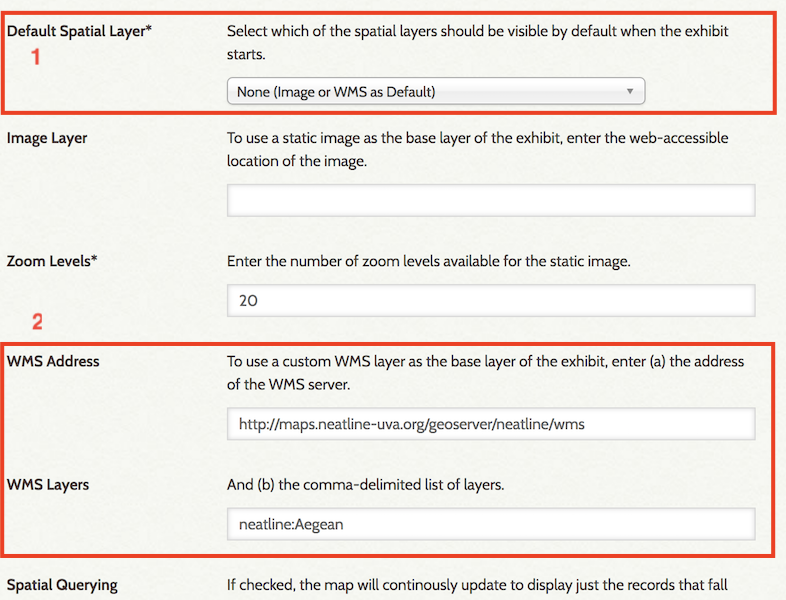 In the field for WMS Layers, enter the layer that you want assigned as the exhibit default spatial layer.